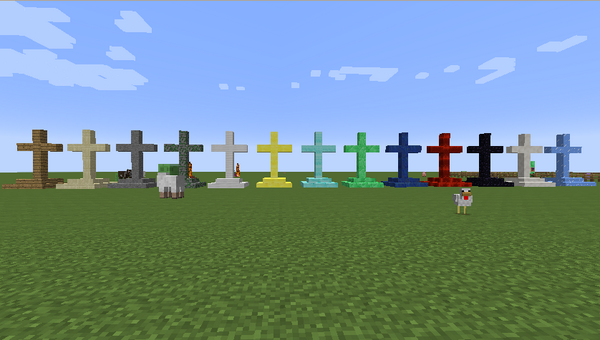 Are you sick of the way gravestones are added to Minecraft, do you want a simpler, more refined way to engage death in this game? The Gravestones Mod might be exactly what you want, because it allows you to access gravestones which will automatically spawn once the player is dead. But this is not all that the Gravestones Mod 1.12.2 does, because it provides you with a great way to spawn cemeteries in some villages, even some catacombs. It is a spooky addition to the game, true, but one that manages to bring in front some interesting challenges as well. For example, the Gravestones Mod Minecraft allows you to remind yourself about the lost companions or about your times when you got killed by a powerful enemy. These are staying on the server, something that makes the mod a true reminder of the gruesomeness and astounding gameplay that Minecraft can offer sometimes. However, the mod also has some other uses, because this can allow you to find the location where you died last time. This means that you can use it to find those items that were lost when you died, something that’s truly helpful all the time. You can also find the lost XP thanks to them as well, which is a major plus since you can re-improve your gameplay based on this great info for sure. You don’t have to kill any villagers, instead the stones will automatically appear randomly on the map. This takes us to maybe some of the best parts about this mod, the fact that it generates a new area for Minecraft, one that is filled with dangers and plenty of dangers that you have to face. Filled with rare loot and loaded with lots of cool stuff, this is an amazing area that you need to peruse, and the results can be astounding. It all helps you further improve your Minecraft gameplay, offering new layers of entertainment and great experiences without a lot of investment. It’s amazing how much content the Gravestones Mod 1.12.2 can actually offer, and the more you play, the more fun you can have with this one. There are plenty of strongholds, and most of them are filled with enemies that will further improve your gameplay for sure. Of course, the gameplay can get pretty hard and violent, so it all comes down to the experience that you might have as a whole. 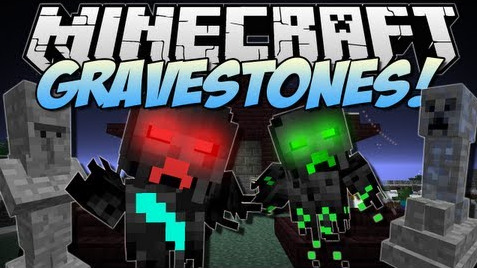 It’s nice to see so much content and pure gameplay in this mod, so if you really want to access gravestones in Minecraft or engage plenty of powerful bosses, then this is something right up your alley for sure. You will love the experience and at the end of the day the outcome will be extraordinary for sure! This block “spawns” at player`s death. You can break it with a pickaxe or by breaking ground under it and put it into another place but only on “diggable” blocks: dirt, grass, mycelium, gravel, sand, soul sand and snow. On another type of surface it can be put only at your death. With a small chance, gravestone can spawn zombies and skeletons at night, and in some specific conditions can spawn pig zombies and wither skeletons. It will be work only if there is any player in range less 35 blocks, and if there are less 3 monsters within 1 block of it. If you have “Mo’creatures” graves will be spawn “Silver skeleton”, “Wraith” and “Flame wraith”. Also this block holds all your inventory and information about your death, wich can be shown by right click on it. Furthermore this block can contains some loot(but only in generated structures), wich will drop when you destroy it. Another way to loot it is right click with shovel in hand. As a default it’s required silk touch pixkaxe to harvest, but it can be changed in configuration file. If you have sword in your inventory there is 25% chance that it will be used as gravestone. Like a gravestone its spawns at tamed dog death. At night it spawn zombie dogs and skeleton dogs. Like a gravestone its spawns at tamed cat death. 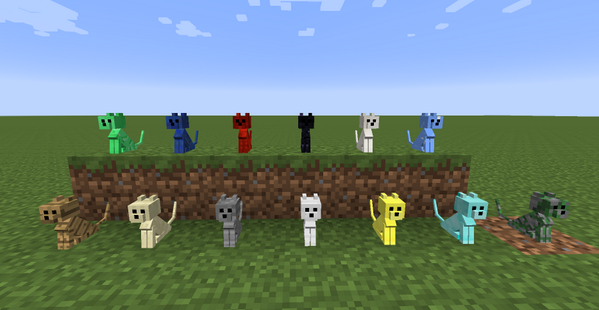 At night it spawn zombie cats and skeleton cats. Like a gravestone its spawns at tamed horse death. This objects works like a “vanilla” spawner, except of one thing. Skeleton spawner can spawn any types of skeletons(Skeleton cat, skeleton dog, Skeleton and Wither skeleton(with a low chance). Skeletons will be spawned with stone sword/bow in hands. Like a skeleton spawner zombie spawner can spawn any type of zombie creatures. This is a special block, which can be found only at the end of the catacombs. It using for Wither spawning. After wither spawn it will be destroyed by self. This block looks like a nether brick, but it have some specific abilities. It is a main part of catacombs trap, wich allowed gravestones to spawn monsters. When you step on it time will change to sunset. It can be break by pickaxe, but drop only if you use pickaxe with silk touch, otherwise it will drop nether brick. 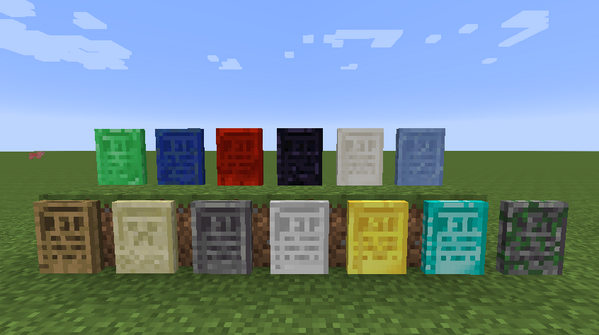 This block looks like a stone brick, but it have some specific abilities. Like a night stone it will be activated when you step on it. But instead of time changing it’ll switch weather to thunder. It can be break by pickaxe, but drop only if you use pickaxe with silk touch, otherwise it will drop stone brick. This blocks is decorative. But it can show some message like gravestone. 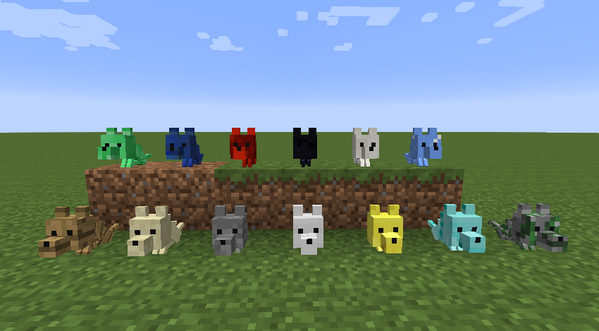 They generate randomly in the world (Also you can generate it using next command “/generate memorial “). So You can harvest it with silk touch pickaxe and place it in any another place. Also you can buy it from an undertaker. Unlike another memorials, this can’t be found in the world, and buy at an undertaker. It’s dropped at charged creeper death. Also you can find it in catacombs. There are 4 types of bone blocks. 2 of them can be crafted from bones. 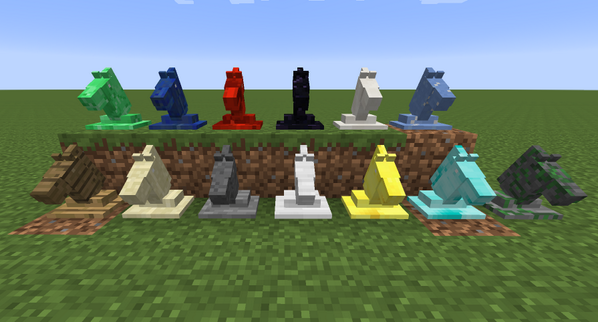 Also, you can craft bone stairs and bone slabs, from this blocks. Another types of this blocks can be founded only at the 3 and 4 levels of the catacombs. There are a skull crawlers inside this blocks, which will be released as far as you destroy it. This object provide light around it. At the moment this block have mostly a decorative purposes. It can be crafted from skull and candle(from thaumcraft or forestry too). It have maximum light value. This object looks like chest, but when you try to open it – it spawn bats/skeleton instead of showing default inventory screen. This block can be harvested only with silk touch axe. But at the moment this object can be obtained only in creative mod. This block can be used for pets/villager resurrection only. With this item you can set custom text on a gravestones and memorials. This items can be obtained at villager / tamed pet death(It will be stored in its grave). There is only one usage for it – you can resurrect this mob by right click on altar with corpse in hand. Resurrected mob will be fully healed and tamed, and have all properties which it have before its death. Also resurrected willager will have restore its trades. He spawns in some villages. His house loks almost like forge, but with some “epty” gravestones on its porch. You can by chisel or “epmty” gravestones and memorial blocks. This monster rather strong and fast like a dog. It attack some peacefull creatures : dogs, cats, sheeps, horses and villagers. When it kills a villager, cat, dog or horse they become zombie too. This monster weaker than zombie dog and attack only dogs, cats, chickens, horses and villagers. When it kills a villager, cat, dog or horse they become zombie too. This monster have only half helth of normal dog, but it is almost twice as fast! This monster have only half helth of normal cat, but it is almost twice as fast! This are small spider like mobs. its behavior similar to spiders and silverfish. they can climb on walls like spiders, and hiding in a bone blocks like silverfish. This mobs can’t be spawned like any another(except wither skull crawler – it can be spawned in nether). But there is a 10% chance that it will be spawned at skeleton/zombie death. This mobs drop bones/rotten flesh and its skulls as a rare drop at death. It generates in some villages. All graves contains some loot. This is a huge structure wich begins at surface and goes very deep underground. Entrance is a big graveyard with mausoleum at it center, but true size of this structure is much bigger. There are a lot of tunnels inside of it, wich can contains graves, spawners, traps, and surely some treasures. At the end you can find Wither, wich guard nether portal. This is a rather rare structure wich can be generated only in next bioms: plains, forest, jungle, ice plains and taiga(if you use “Highland”, “ExtrabiomesXL” or “Biomes O’Plenty” – check compatibilities section for more information). Beware there is an ancient curse protecting it from any “inviders”! Every generated grave contains some loot. Mostly this are few bones and some rotten meat. But with a rare chance it can contain skeleton or zombie scull too. There are exists diffenrent type of graves wich contains some additional loot. 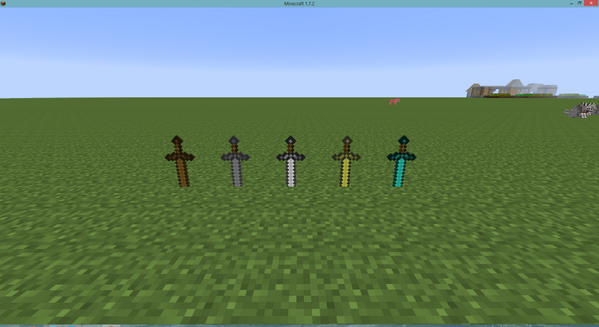 It can contain almost full diamond/golden/iron(more valuable a rarer) armor(some chance for every item), sword and bow. All warrior’s graves use its sword as gravestone. It can contain diamond/golden/iron(more valuable a rarer) pickaxe and some diamond/emeralds gold/iron redstone/lapis lazuli. Here you can find potions/enchanted books and some potion ingredients. Here you can find empty map/clock/compas, writable book, paintings/records, sticks, cookies and peacefull creatures eggs. Surely they are in order of ascending chance.